Not much... but long as you can slide.... way to get some SUPER early. Got couple months to wait here. Love it. That's typically what my 1st tracks of the season look like. Sure as heck beats no kiting at all! Send some of that white stuff my way! Don't get too anxious too early or you might be in for a surprise. My area only got a couple inches from this one and the farmers figure it'll be two weeks at least to get back in the fields and finish harvest. Plus you never want to deal with the problems that come with a foot or two of snow that comes before the ground freezes, it's a muddy nightmare. That being said, I wish it would hurry up and start freezing! Yee Ha! Way to go Bill! You need to make a point of going to Spray Lakes in April or May and lay claim to the longest snowkite season this year. I was back home in " Cow Town " the weekend before last for a wedding + to see Mom's new place. Sorry I didn't contact you but it was a quicky visit and all Family. Thanks Ken, April is usually no problem for Spray and often can go into mid-May at other spots in the mountains. I was in Toronto when you were here so we would have missed contact anyway - glad you had some Family time. Brant, that was a bad storm in Saskatchewan. I hope the farmers can salvage their crops. I'll take snow cover anytime - keeps the soccer players away. It is pretty wet before freezeup but it is great to still be able to use a ground stake instead of a screw. We had snow this morning but was gone by the time the sun came up. 2 feet of New at the pass only a half hour away. To many trees at the pass and the lake isn't frozen yet. Soon I hope. Offaxis, that looks like it will be a sweet kite spot once you get some snow on it. Do you typically get much snow coverage in the winter? There is still snow on the ground here. The first this winter but I don't know if there will be enough to do anything with. In January and February snow will stick around for a week or two. Usually long enough till the next storm rolls through. Some years we go without snow. Other years we can get a lot. We got a big storm laat year of 30in at once so that stayed around for a while. I got my first day this season! low steady wind, just enough snow. Nice! Low, steady wind - that's my favorite! SWEET! Nice to see you getting some in SoVT! Beautiful shot of your big green monster too. A very merry Christmas indeed! I need to go test the ice on my lake. It froze over 4-5 days ago, and it's been in the single digits for a few days now. The wind has been howling in the 20's to maybe 30mph, so it's a bit beyond my comfort range on a kite anyway for now. Finally got some snow in the forecast for the 17042 zip code. Friday night into saturday turning to rain. So it might not play out in my favor but I'm hopeful. There was 2-4" of very wind blown snow over ice, and it was kind of drifty so bare spots and deep spots on the lake. The wind packed snow was really heavy, even though it was dry snow. Made it challenging to ski and especially turn, felt a little uncomfortable actually. Still a really fun session and I'm happy I went out. Definitely more comfortable in higher winds now, so this will open up a lot more days for me. Although technically not the first snowfall for us, it was my first session of the winter here in Wisconsin. Lakes are finally frozen enough to get out and put some miles on the skis. We have plenty of snow on the ice already which isn't the best since the ice wasn't that thick to begin with. Had my first Flysurfer Speed experience as well. Winds were very light so it was a great opportunity to get my first taste of a Speed. So far I love it! It's definitely a different kind of animal. Takes a little finesse to get it inflated and launched, but after that the rest was pure enjoyment! Reminds me a little of launching arcs. Can't wait for my next opportunity to get better acquainted. Looks like you have more snow on your lake than I do on mine. All the snow blew off the lake and into my driveway I think. Glad you're enjoying the speed 3. I have the same kite but it's the 19m, and I haven't flown it yet. Waiting for a nice light air day to get the beast out to play. I need to stop trying to kite with kites that are too small for the wind... gets frustrating in a hurry lol. Took the 9m Montana for a ride today, first time skiing with that kite. I thought there was going to be more wind out on the lake, but it was only blowing probably 4-7mph. Had a decent ride, took some work to build apparent, but even the slightest down-wind course brought the kite out of the sky. The kite seems very prone to wing tip tuck, and it kept collapsing on me as I'd try and turn it through the window. It's an older kite, not sure if the bridles are out of wack or if it's me or the lack of wind. It definitely held shape better when I'd hit a "gust" and start moving faster. I can tell this is going to be a fun kite in more wind though. It really wants to move fast, and it has a huge power difference through the bar throw. If it was truly 4 to 7, I would've been on that 19 meter speed of yours. It was 13 to 20 today here and I was using my 15 meter speed no problem. Didn't bring my wind meter, but it was extremely light for sure. I still haven't had the speed in the air yet, need to find a backpack for it or something, it's a loose kite at the moment. like he said not enough wind for that sized kite. With a 9m you probally need a good 15mph to snowkite. 7mph is 16m sized and bigger foil. like he said not enough wind for that sized kite. With a 9m you probally need a good 15mph to snowkite. 7mph is 14m sized and bigger foil. Chance of a dusting tonight. Hopefully it will stay cold enough stick around till Sunday. I just measured out 4 riding spots totaling close to 1000 acres of potential riding if the snow will snow up. Bring on the snow!!! The wind was around 10mph fairly steady, dropping a bit as the sun went down. I used the Summit 12m (also for the first time lol). The kite is awesome, it was really cool to feel the power difference with bar throw, much greater range than I've experienced before. Also playing with the depower trim actually made a noticeable difference in the power. Not sure if that's because I actually had enough wind to power the kite up properly, ozone makes awesome kites, it's a new kite, or a combination of all 3. Anyway, the thing is way more tuned and precise feeling than the montanas. My one question is about going up wind. I usually don't have any issue making gains up wind, but I was struggling a little tonight. When I was making good windward progress, I was going pretty slow and the kite wasn't pulling hard. If I pulled in the bar and moved the kite back in the window slightly, it would gain a lot of power but I'd go sideways instead of forward. I don't have a lot of flying time, but I haven't noticed this as much on the montanas, the access, or the apex. Probably user error, but any hints or thoughts would be appreciated! Still having trouble going upwind with the Summit. I've attached a couple of my gps tracks from last week and today. Today's conditions were almost the same as last week, winds around 10mph but I was making slightly better upwind gains today. I was flying the kite higher in the window and that seemed to allow me to point a little better. It still doesn't feel great, but I don't have tracks from my other kites to compare to right now. 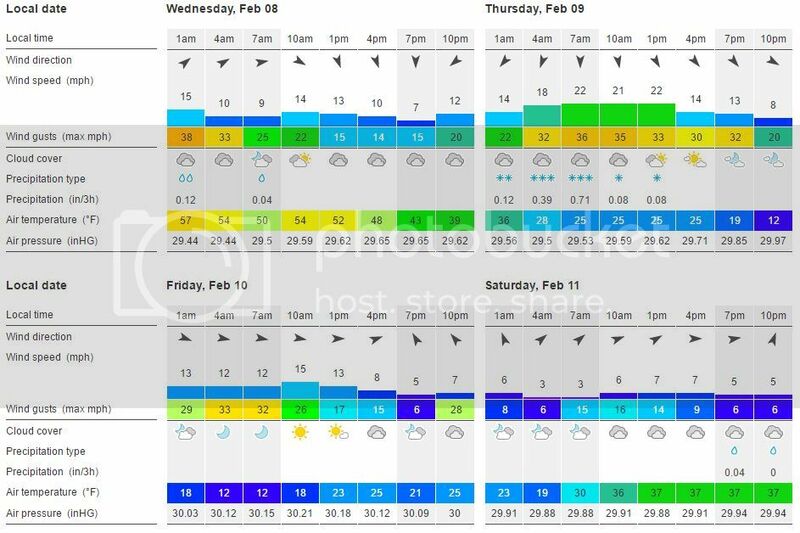 I have found that flexing my knees and hips and getting low over the skis and really crank both edges helps the up wind edge grip..
First major snow forecast is supposed to arrive overnight!!! I hope we get 5+ inches. Probably going to take off work Thursday. Not sure how I feel about flying my 7.5M Apex in 30mph gusts. I guess there's only one way to find out.